HMS Middleton will be returning home to the UK on 14th December after a 4½ month deployment as part of the Standing NATO Mine Countermeasures Group 1 which includes contributing nations from Belgium, Netherlands, Germany, Poland and Lithuania. They started off the trip with two periods of minehunting operations in the Baltic Sea off the coast of Estonia which proved to be a fruitful hunting ground for mines left over from the First and Second World Wars. After a rare visit to St Petersburg to further NATO and Russian relations, historic ordnance disposal took place near Lithuania. This included a multi-national Partnership for Peace exercise with ships from 21 different countries. In October they transited west to the more exposed waters of the English Channel for more minehunting operations in the Bay de Seine. Here the ships cleared a significant amount of ordnance that once littered fishing grounds and shipping lanes in the area. Middleton detached from the rest of the group for a fleeting and impromptu stop in her base port of Portsmouth to have a new engine fitted, before rejoining en route to the only UK stop of the deployment in Aberdeen. This visit incorporated Remembrance Sunday and a number of sailors from both Middleton and the NATO group marched through the city in the Remembrance commemorations to pay their respects to the fallen. The temperature dropped as the group set sail for the fjords of Norway where the scenery never failed to impress. 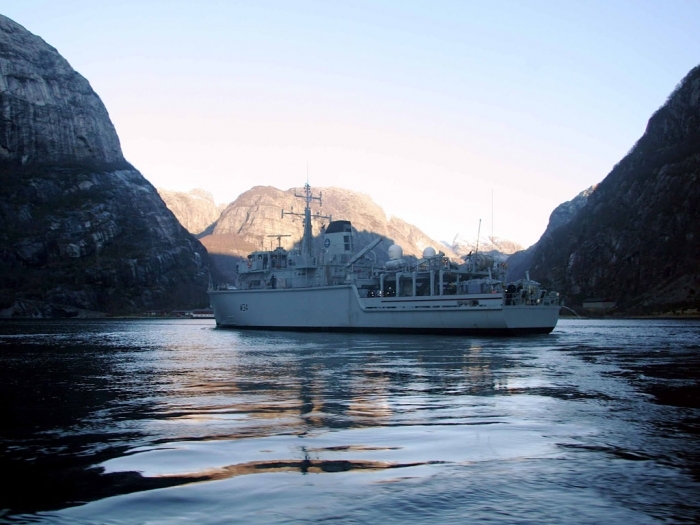 It was a perfect opportunity for Sub Lieutenant Ben Kirkby to begin the first part of his navigation training on board by negotiating his way through the archipelagos of Norway’s west coast. A weekend stop in the Hanseatic city of Bergen was the setting stage for the week long exercise that was to follow. Augmented by two Norwegian ships, the NATO task force was brought in to police the waters between fictitious warring nations. Middleton took control of the group to coordinate shipping throughout the area providing a surface picture for the NATO ships and a deterrent to any terrorist activity. Despite multiple (exercise) terrorist threats from fast moving attack craft, merchant shipping and buoyant mines, the NATO task group managed to diffuse the situation returning peace and stability to the area. Diver Maddy had the rare opportunity to dive on a buoyant mine donated by the Norwegian Navy, successfully placing an explosive charge which detonated the mine and ensured safe passage for shipping in the area. Moving on to Germany the group had one final exercise to look forward to. A further week of multi threat scenarios kept the Ship’s Company on their toes with air, surface and sub surface threats used to simulate a number of scenarios that could be encountered in a UN peacekeeping role. The last exercise of the deployment served as an example of the how well the force has integrated during their time together and their versatility to respond to a wide variety of situations. Commanding Officer, Lieutenant Commander Steve Holloway took command of the ship just two days before she deployed in July. After a final opportunity for shopping in the traditional Christmas market of Lubeck, the Ship’s Company is looking forward to the homecoming. Friends and family will be gathered on Round Tower to welcome their loved ones back home. Middleton now moves in to an extended maintenance period in Portsmouth and some welcome time alongside after what has been a challenging period for all involved with the Ship. HMS Hurworth takes over the NATO baton from Middleton in January. The UK also takes over responsibility for control of the Group with Commander Davies embarked in HMS Roebuck. 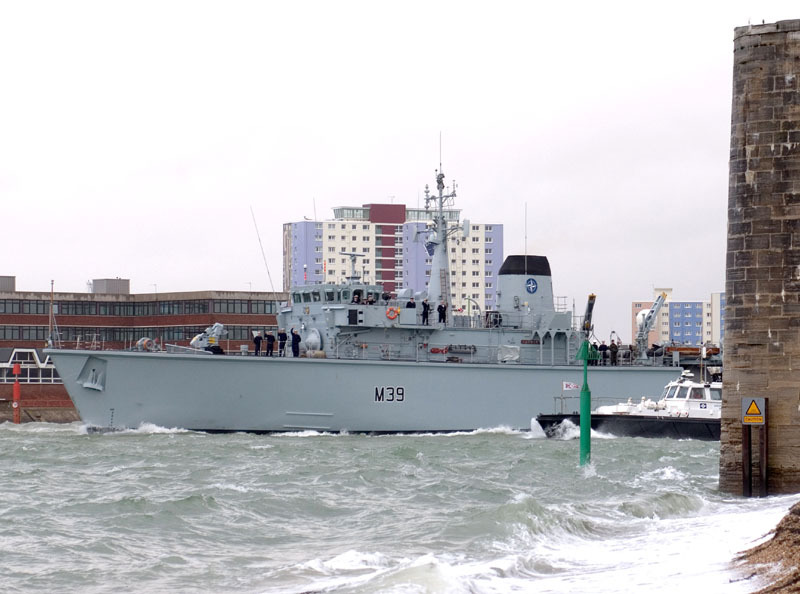 HMS Hurworth left Portsmouth Naval Base yesterday, Tuesday 8 January 2008, to undertake a minehunting mission in the Baltic Sea and northern Europe. 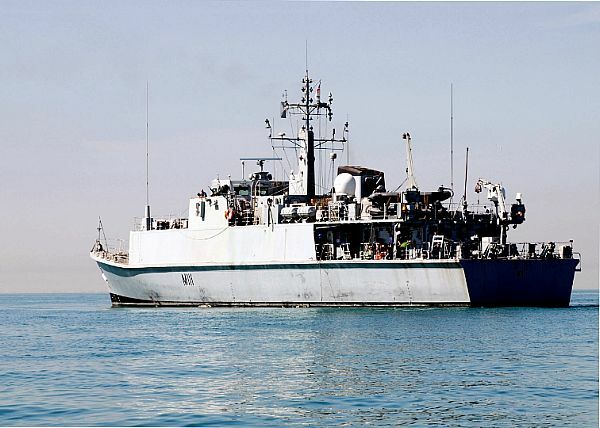 The four and a half month deployment will see the Hunt Class Minehunter clear some of the thousands of mines laid during the two world wars, that still pose a hazard in the region. She will also work within a NATO task force comprising ships from Belgium, Germany, the Netherlands, Lithuania, Poland and Norway. The task group - known as Standing NATO Mine Countermeasures Group 1 - is NATO's immediate reaction force, ready to deploy anywhere in the region at short notice. It was established in 1949 as a permanent force, with member countries providing vessels on a rotation basis. It provides a constant and visible reminder of the solidarity and cohesion of NATO, keeping strategic waterways free from dangerous ordnance. 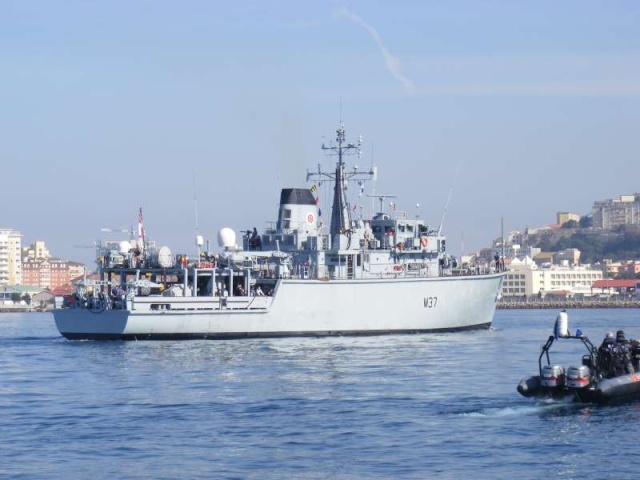 As well as clearing mines, HMS Hurworth will be undertaking a series of exercises with other ships from the NATO group. Goodwill port visits are planned for Lithuania, Germany and Belgium. "The ship will be operating in the North Sea and in and around the Baltic exercising with a number NATO nations under UK Command. The ship's company are very much looking forward to the deployment as we travel to a number of foreign countries to participate in numerous exercises. The autumn period has been spent preparing for this period away and we are now fully stored and ready to represent the UK in this important alliance." On Thursday 10 January 2008, British Commander Chris Davies Royal Navy took command of Standing NATO Mine Countermeasures Group 1, a multinational force of 5 survey ships, mine hunters and mine sweepers. Commander Davies relieved Belgian Commander Serge Ots who has commanded the force since January 2007. 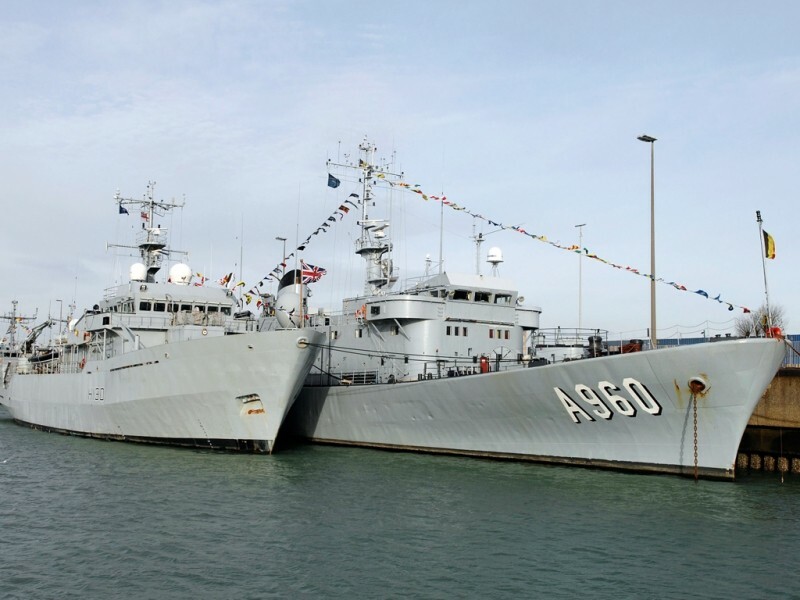 A Change of Command Ceremony took place in Zeebrugge on 10 January upon reassembly of the group following Christmas Leave, the Royal Navy survey ship HMS Roebuck took over Flagship duties from the Belgian BNS Godetia. The following 2008 schedule includes several Live Mine Clearance Operations in the North and Baltic Sea as well as participation in several demanding exercises including the NRF Live Exercise Loyal Mariner 2008. These will take place off the Spanish Coast in June 2008 bringing together numerous ships, aircraft and submarines in a joint exercise under the responsibility of Admiral Sir Mark Stanhope KCB OBE, Commander Allied Maritime Component Command Northwood. 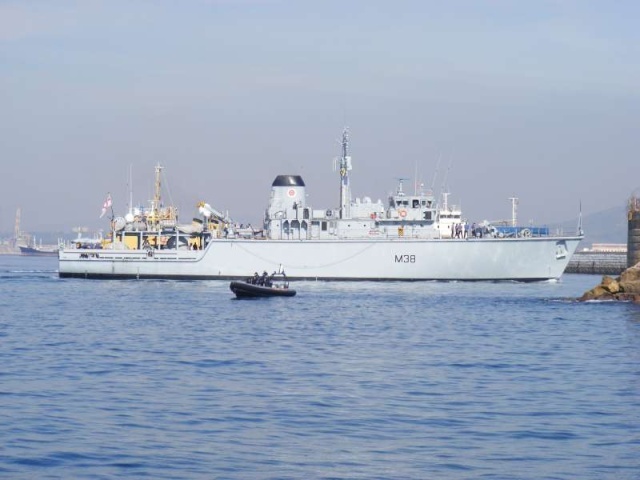 On the 23rd of January Hunt class Mine Countermeasures Vessel HMS Chiddingfold, sailed from Portsmouth in company with another Hunt, HMS Atherstone. Both ships are heading to the Indian Ocean where they will exercise their mine hunting skills with the Orion 08 Task Group led by the Aircraft Carrier HMS Illustrious. The Ships were given a warm send off by the mine hunting community in Portsmouth Naval Base, and by families and friends waving from the Round Tower at the entrance to Portsmouth Harbour. 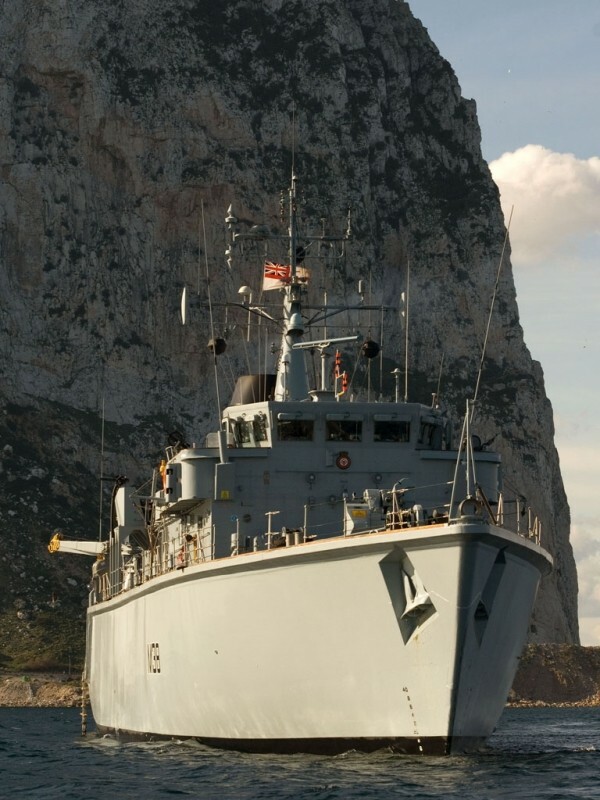 As storms lash British shores, Royal Navy minehunters HMS Atherstone and HMS Chiddingfold have been taking advantage of Gibraltar’s mild winter to trial new equipment and continue working up their mine-hunting capability. HMS Atherstone’s mine clearance diving team have also been taking advantage of the conditions to hone their skills. Leading Diver Adrian Morris, HMS Atherstone’s dive team leader, spoke highly of the conditions, describing them as ‘absolutely ideal’. “My teams have been in the sea exercising every day,” he said. “Out here, every day is a great diving day!”. Following a well deserved Christmas Leave period, where we all got a much needed break after the hard-work of Operational Sea Training (OST) and preparing HMS Penzance for refit in Rosyth, we flew out to Oman to take over HMS Blyth on 5 Jan 08. It was quite a shock for many leaving a wintry UK (with snow still lying on the ground in many places) to land in a wintry Oman (with temperatures in the mid 20 degrees Celsius). Following the flights and bus rides we arrived at our destination of Wudam, a Royal Navy of Oman Naval base about an hour north-west of the Capital, Muscat. This was to be the location of the handover with the Blyth, who had sailed down from a maintenance period in Bahrain. On arrival we were straight into the handover programme, which involved working closely with our opposite numbers in the outgoing crews to ensure that everything was in place, and benefiting from the previous crew’s experiences over the last 8 months of their deployment. In addition there was the usual mountain of paperwork to be completed in relation to the handover. It was certainly with a degree of relief when the CO completed his Supersession on 10 Jan 08 and Blyth was finally ours once again. Following the handover there was no time for a break as we went straight into preparations for the visit of Flag Officer Sea Training Staff the next week. This visit was to ensure that the new crews of Blyth and Ramsey were ready to commence operations. A challenging programme of exercises was designed to test us on everything from fire fighting to navigation in confined waters, and from dealing with an attack from another vessel, to our main role of mine hunting. This formed us back into an efficient team ready to face the challenges that lie in the months ahead. With all our training complete it was time to leave Wudam, and the extremely warm hospitality of the Royal Navy of Oman. 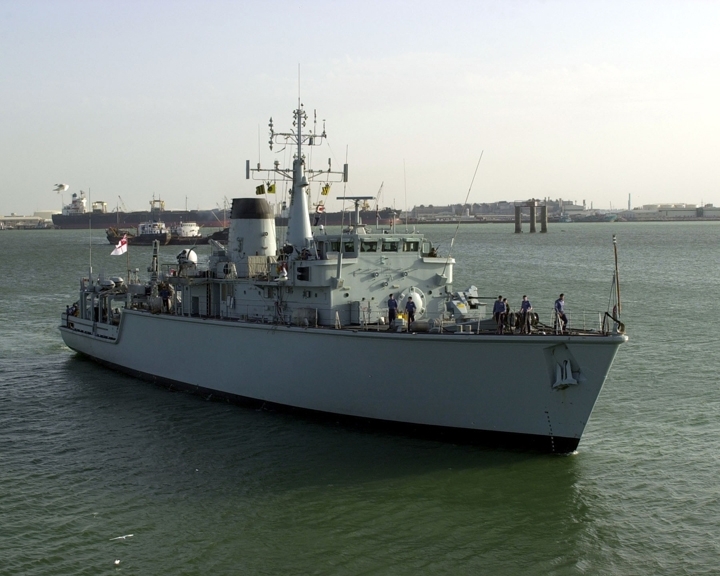 HMS Blyth is now on operations in the Arabian Gulf with her Sister Ship Ramsey as part of ‘Aintree 3’. After completing another successful ‘roulement’ (crew swap) at the beginning of January, only the second full exchange of Ships’ Companies since they departed the UK for the Middle East in November 2006, the Royal Navy’s two Arabian Gulf based Sandown Class Mine Hunters, HM Ships Blyth and Ramsey, have continued to produce the same impressive results as their predecessors during Mine Countermeasures (MCM) Exercises with the US Navy. Although the two ships primarily operate out of their Forward Operating Base of Bahrain, the fact that the first roulement took place in Kuwait (in May 2007) while the most recent took place in Oman will give you some idea of how far and wide these ships roam. 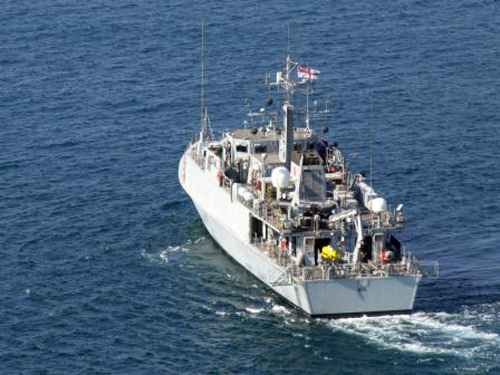 Although they may only have little legs (the ships are designed to operate at slow speeds in a minefield and hence can only reach a maximum speed of 12 knots), the new crews (from HMS Penzance for Blyth and HMS Bangor for Ramsey) have already shown that their speed does not limit their reach, and the first RAS in 10 months between Ramsey and USNS Arctic (a ship that displaces 100 times more water than a Sandown) has proved that the ships can remain at sea for as long as they have a Tanker to support them. This will become even easier in March, when RFA Diligence arrives in theatre as part of the Orion Deployment, and the ships will then be able to raft-up to embark fuel, water, food and stores – all at the same time. Having settled into their new homes quickly, with the assistance of the staff from the Flag Officer Sea Training’s (Mine Warfare and Patrol Vessel) organisation based in Faslane, the proof of the pudding came when both ships sailed with a US MCM group - consisting of two ships (US Ships Ardent and Scout), four ‘Sea Dragon’ MH53 helicopters and an Explosive Ordnance Disposal Diving Unit – to conduct a two-week Exercise in the Central Arabian Gulf. The Exercise simulated clearing a route into a key Gulf port, in order to ‘rescue’ a US Carrier which had been mined into the harbour while undertaking defect rectification. The benefits of Royal Navy training shone through and, in addition to scoring the highest mine tally of any unit (Blyth – with no mines left behind, incidentally! 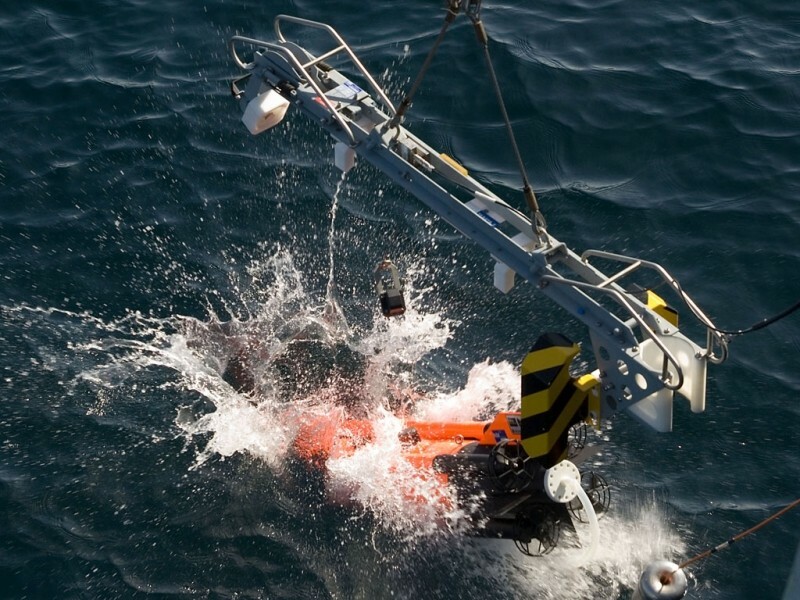 ), both ships were able to practice live firings of Mine Disposal Charges and Diver-placed Charges. Although only consisting of 4lbs of explosive (2Kgs in new money! ), the Diver-placed Charges are capable of lifting a moored mine-shape well-over 100m into the air, as the photograph shows. 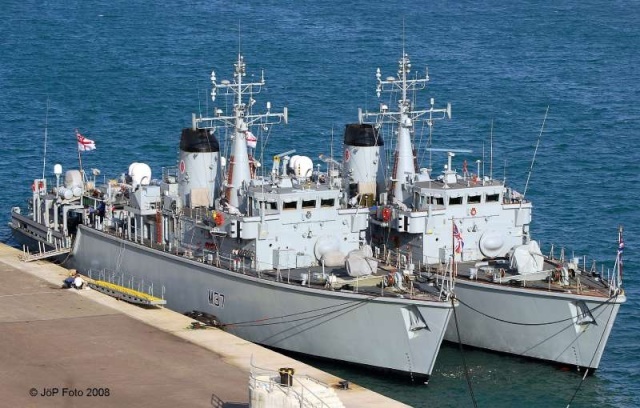 Next month will see Blyth and Ramsey conducting another Exercise in the Gulf, this time with Kuwaiti and US Forces, before the undertake a maintenance period and join the Orion Deployment for a short period. 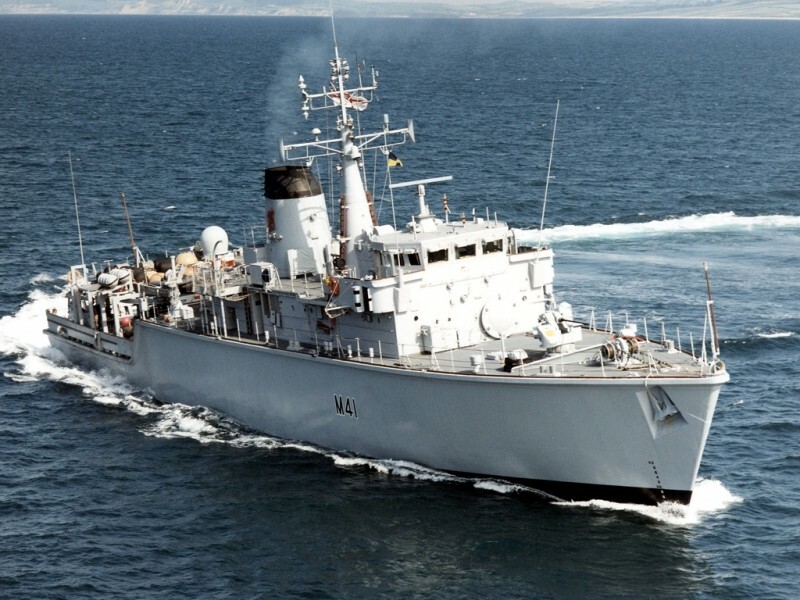 A Royal Navy warship from Scotland’s own mine hunter squadron will visit Ayr this week (27 February – 5 March 2008) as HMS Shoreham sails in for a week long visit. 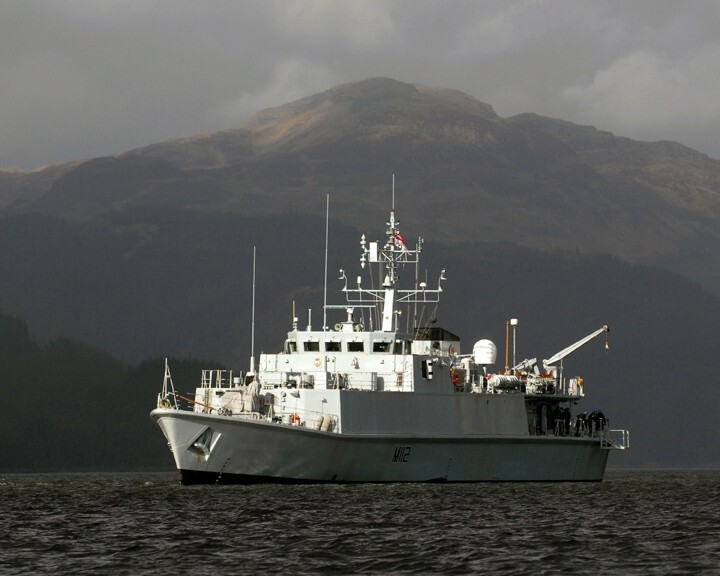 One of six Sandown Class mine countermeasures vessels (MCMV) based at HM Naval Base Clyde on the Gareloch, HMS Shoreham is one of the most sophisticated mine hunters in the world and she’s in town to help strengthen links between the local community and the Royal Navy. During her stay, the ship will host visits from a number of local organisations and schools, including the Sea Cadet units TS Mountbatten (Ayr), TS John Paul Jones (Stewarty), TS Argyll (Irvine), TS Gannet (Ardrossan) and pupils from Kyle and Stewarton Academies. They will all be given a tour of the ship and the chance to meet some of the crew. And lucky pupils from Ayr Academy will get the chance to spend the day at sea onboard Shoreham as she sails out on Wednesday to the Firth of Clyde approaches to rendezvous with a Sea King helicopter from the Royal Navy’s search and rescue base at HMS Gannet in Prestwick. On Friday, the ship will host a unique Careers Forum for local Head Teachers and Royal Navy Careers Officers from across Ayrshire. The forum aims to encourage a closer working relationship between the two groups and learn how they can each benefit from one another in providing career opportunities for young people across the country. Shoreham participated in last year’s Exercise Neptune Warrior, an intensive, multinational warfare training programme off the west coast of Scotland involving Naval, Air and Land Forces from the UK, NATO and beyond. This has been followed by a busy programme of high profile port visits, more training exercises and an operational deployment to come later in the year. Shoreham and her sister ships have the task of helping to keep ports and coastal shipping lanes free from the threat of mining, an essential part of successful maritime operations. Hundreds of mines, bombs and torpedos from the Second World War are still washed up around the coast of the British Isles every year. 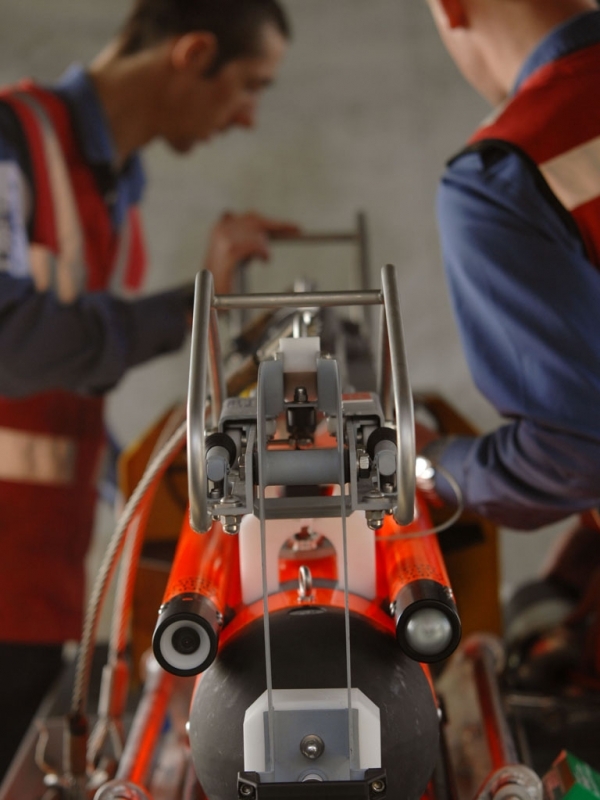 Modern mines can be triggered not only by collision but also by the sound of the ship passing through the water or by the magnetic signature of the ship's hull, which means modern mine countermeasures vessels have to be very sophisticated. Every effort is made to reduce the magnetic signatures of the ships, and their hulls are made from glass reinforced plastic rather than steel, making them pound for pound and inch for inch one of the most expensive warships ever made - even the buckets on board have to be made from non-magnetic materials! 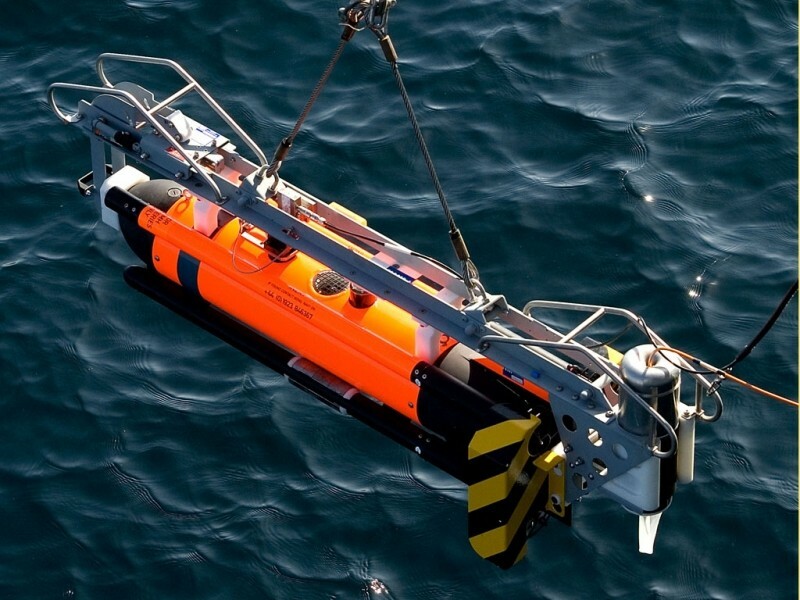 Modern MCMVs have added high definition sonar and unmanned submersibles. 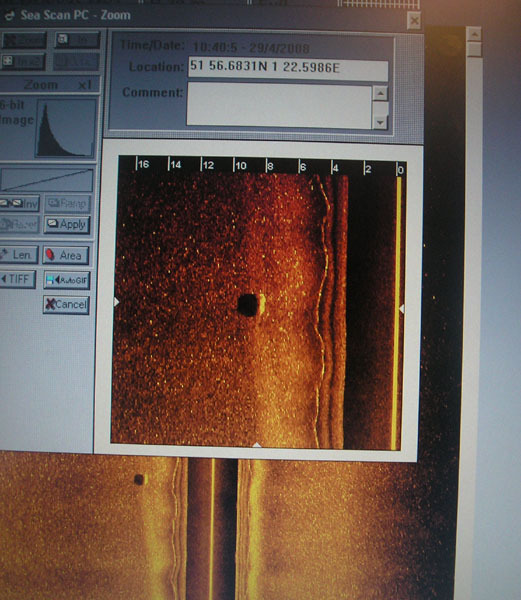 The sonar can find mines on the seabed or in mid-water by bouncing high frequency sound waves off them. The submersibles are then guided to the mine and destroy it using a high explosive charge. PERSIAN GULF (March 1, 2008) The British mine countermeasures ship HMS Blyth (M 111) participates in a combined maritime forces mine countermeasure exercise in the Persian Gulf. 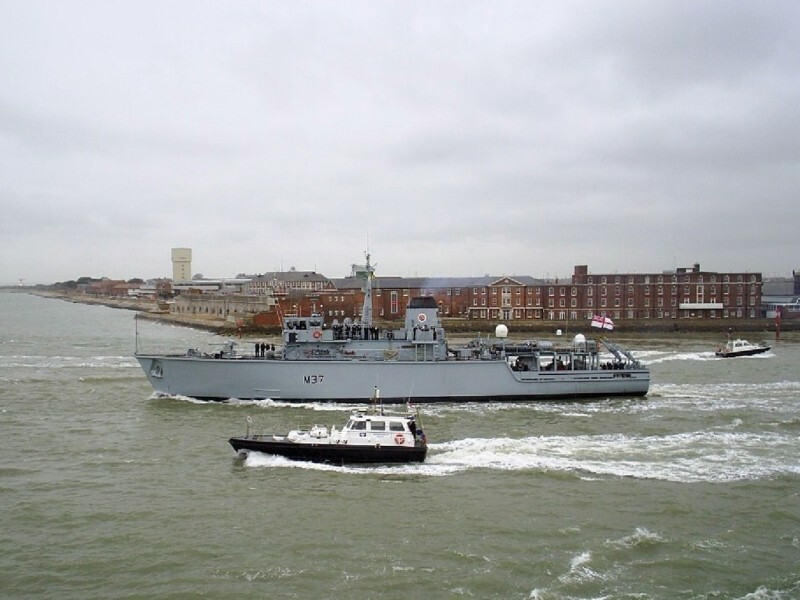 Royal Navy mine hunter HMS Ledbury will sail up the River Thames to London on Monday (10 March 2008) to support Oceanology International 2008. The 625 tonne ship will berth alongside the ExCel Centre at Royal Victoria Dock for a three day visit in support of the annual exhibition. Oceanology International (OI) is the world’s largest and most respected meeting place for the marine science and ocean technology community. 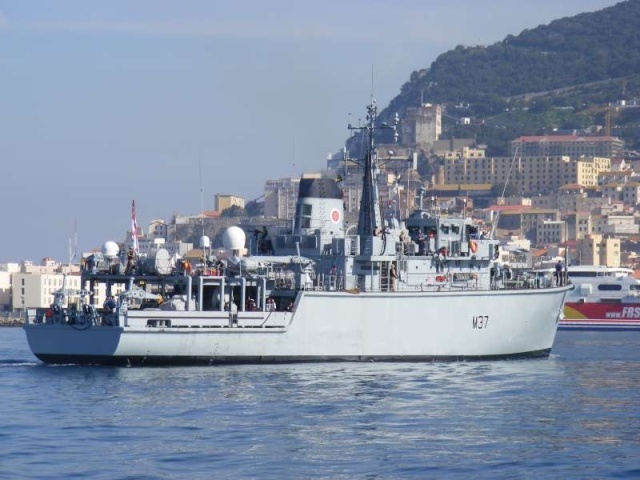 It hosts an agenda setting conference, live demonstrations of the latest industry technology and visiting vessels, including this year HMS Ledbury and French naval survey vessel BH Laplace. Ledbury has recently completed a routine maintenance period, during which her command system was upgraded and her accommodation spaces improved. Ledbury has spent nearly two years on Fishery Protection operations around the UK coastline, enforcing UK and EU fishery regulations by questioning and boarding scores of fishing vessels. After Easter, Ledbury is returning to her primary mine-hunting role and will be carrying out an intensive period of warfare training before deploying to European waters with a group of NATO vessels later in the year. 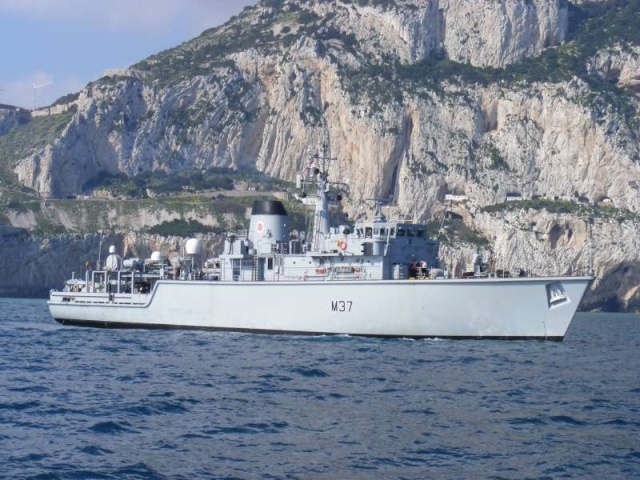 HMS Ledbury is one of eight Hunt Class Mine Countermeasures Vessels (MCMV) made from glass reinforced plastic. She is pound for pound and inch for inch one of the Royal Navy’s most capable warships. Her 60 metre long glass-reinforced plastic hull minimises the ship’s magnetic signature, a method many modern mines use to detect ships. This week has been a busy week for Quorn conducting Fishery Protection Patrol, not least for the Navigation Department and Bridge Team. As often happens, the plan for the week frequently changed and this meant planning a route taking us east towards Margate before reversing our course and heading west around Lands End to Padstow. We then returned back around Lands End, passed by Lizard Point and went south to the Casquettes Traffic Separation Scheme which is just North of the Channel Islands and the Channel equivalent of the M27. Finally we ran east, chased by gale force winds, to make our arrival time in Portsmouth. It has been extremely busy for all but particularly for the Bridge Team, led by the Navigator, Lt Jon Fletcher, who is responsible for planning all of the routes the ship follows. Specific navigational tasks such as anchorages and the pilotage in and out of Portsmouth have been conducted by our two young officers, Lt Simon Holbrook and Lt Roger Skelley, who are undergoing their Specialist Fleet Training onboard. The Executive Officer, Operations Officer and Gunnery Officer took charge of the ship during day to day evolutions, such as positioning the ship in close proximity to fishing vessels and driving along the navigation track in busy shipping situations; a particularly interesting job in one of the busiest shipping lanes in the world. They are assisted by their bridge team consisting of a Bosun’s Mate and Quarter Master who steer the ship, run the ship’s programme, keep the log books up to date and maintain a good lookout. All members of the Bridge team sit watches of four or two hours length for a minimum of between 8 and 10 hours a day. It’s been hard work for all the team this week with several involved with the boarding of fishing vessels during both day and night. Two members of Quorn’s crew board each fishing vessel after it’s been questioned on the radio. The boarding team are embarked using our sea boat and they check the fishing vessel’s paper work, catch, and equipment and question the crew. Launching, recovering and maintaining the sea boat is a team effort involving most of the ship’s company, not least the bridge team. As well as conducting boarding operations, following a constantly changing navigation track and avoiding shipping, the bridge team have also conducted a personnel transfer by helicopter off the eastern coast of England at short notice – and before anyone asks, no we do not have a flight deck! The transfer is done on the f'o'csle using a winchman and requires some delicate flying from the helicopter pilot. The final leg of the week saw us heading north east back to Portsmouth in an increasing sea state as the westerly gales chased us up the Channel and into Portsmouth on Saturday morning. As I write we are looking forward to a short weekend break before a busy week at sea conducting Mine Warfare training for newly recruited Mine Warfare ratings and the Royal Naval Reserve, prior to returning to sea for our last Fishery Protection Patrol. 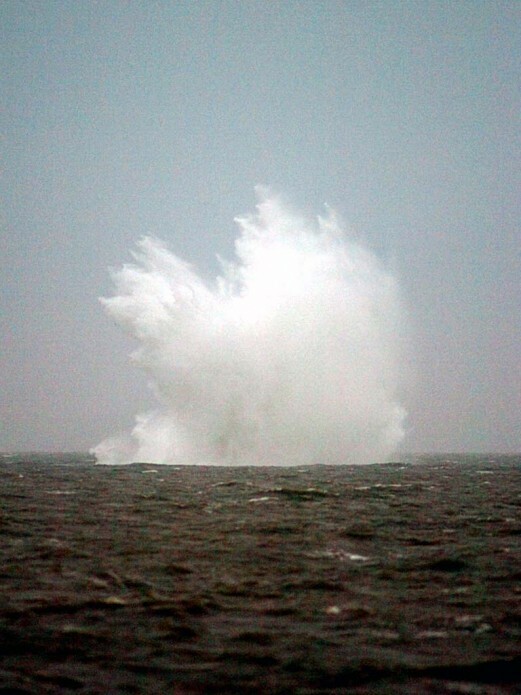 A team of Royal Navy divers and explosive ordnance experts has successfully detonated a World War II bomb off the Suffolk coast. Report by Leigh Morrison. The 11-man team confirmed the location of the explosive using the unique searching capabilities of the Remus unmanned submersible vehicle yesterday evening, Tuesday 29 April 2008. The data gained from the side-scan sonar onboard the Remus submersible indicated that the bomb was 1.15 miles [1.85km] off the Felixstowe seafront. The recent extreme weather conditions resulted in the necessary resetting of the fuse connected to the bomb before the Navy team could progress with the explosion. A one mile [1.6km] exclusion zone was set up and, after a short wait until a tidal window was available, divers detonated the bomb at 1940hrs. After the bomb was detonated, vibrations are said to have been felt up to two -and-a-half miles [4km] away from the site, with some residents reporting slight shaking in their homes. The exercise was carried out safely and nobody was hurt. With the bomb being in nine metres of water the explosion caused a plume between 150 and 200 feet [45.7-60.9m] high to rise into the air. The 500kg device, which was identified as a German bomb left over from the Second World War, is thought to be one of the largest ever washed up on the British coastline. It was found on Monday 21 April 2008 when a contractor working on sea defences in the area accidentally scooped the hefty shell up with his digger. Around 1,200 Felixstowe residents were initially evacuated from their homes and a half mile exclusion zone was cordoned off by police around the area. The cordon was lifted at midday on Tuesday 22 April 2008 when a team of Royal Navy bomb disposal specialists towed the bomb out to sea and to safety. A sea exclusion zone was then set around the bomb to protect local shipping. The Navy team had originally planned to carry out a controlled explosion last week, but strong tidal currents made it impossible for divers to attach a charge. Heavy rain and fog furthered hampered the team's efforts to reach the bomb making it necessary to delay the operation until yesterday. "The Explosive Ordinance Disposal operation at Felixstowe demonstrated the adaptability of Royal Navy clearance divers who used a broad range of core skills and advance technology to successfully remove a dangerous threat to public safety in challenging environmental conditions," he said. "The team of divers from the Fleet Diving Squadron were happy to complete the task and will now return back to their bases for further work." The Royal Navy team made a total of 50 dives in arduous conditions throughout the operation to secure the safety of residents living nearby.